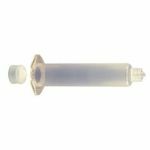 Jensen Global Air Syringes pneumatically-operated syringes barrels are manufactured with a heavy flange and are custom designed to withstand pressure. We package these with a white polyethylene stopper for drip-free dispensing to safely dispense material up to 100 psi. A syringe adapter connects the shot meter or foot valve with an air syringe and pressurizes the stopper to precisely dispense material. 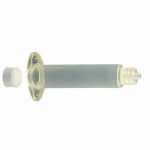 Purchase Jensen Global Air Syringes Today! 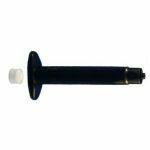 Jensen Global Air syringe barrels are manufactured with a heavy flange and are custom designed to withstand pressure. 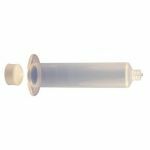 We package these with a white polyethylene stopper for drip-free dispensing, however several other options are available. These options include: a red straight-wall stopper for high viscosity material, a red thermal stopper for low viscosity materials, or a blue plastic stopper designed specifically to reduce back pressure when dispensing cyanoacrylates (CA). ESD-safe or Ultra Violet (UV) blocking air barrels (amber or black tint) are also available. 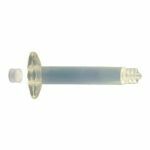 Jensen Global Tapered Tip Air Syringes are one-piece molded barrels are made of polypropylene and do not require a dispensing tip to operate. This natural colored syringe is available in four different tip sizes and offer a great alternative for dispensing thicker materials. The tapered tip can be cut back to widen the opening and allow more material to flow. 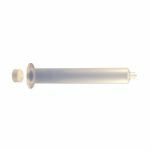 Jensen Global Syringe Adapters are precision molded adapters to connect Jensen Global air syringe barrels to the air output of the dispensing unit. Designed for ease of use with minimal effort, these adapters will attach securely every time. These adapters have a 1/4” or a 5/32” tubing and come with either a white QC fitting or a black universal fitting. JG30A-20-UVB Jensen Global 30cc Black Air Operated Syringe 20/Pkg. 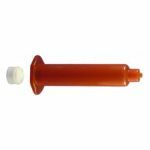 JG30A-20-UVA Jensen Global 30cc Amber Air Operated Syringe 20/Pkg.